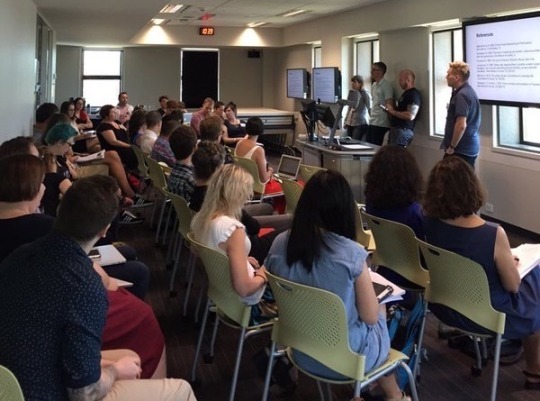 On November 19 + 20, Amy Dobson, Nic Carah and I co-convened a symposium at UQ titled ‘Digital Intimate Publics: Identities, Relationships and Value in Social Media Cultures’. We had 26 papers covering a range of topics, platforms, theoretical frameworks, and disciplines. There were strong themes around how digital social media structure intimacy in different kinds of ways, how networked publics might act as counterpublics, and the diverse practices that users enrol to ‘be’ in networked publics. We talked hook-up apps, Tumblr, Facebook, YouTube, Vine, Instagram, the Zyzz phenomenon, families, metaphors for describing digital ‘spaces’, feminisms, manspreading, digilantism, GamerGate, gender identity, sexualities, mourning, archives, research methods and more more more so much more. You can find the full program here. Our intention was to bring together some key players in the study of digital intimate publics in Australia, and I think we were successful. The papers were all really terrific and hung together so well. The two days were thoroughly stimulating, and the plan is now to turn it all into something coherent – perhaps an edited book – if we can. Thanks to all the presenters, session chairs, brilliant keynotes, UQ’s IASH and School of Communication and Arts for hosting, and my wonderful-amazing-brilliant co-convenors, Amy and Nic. I’ve archived some tweets below.